Sometimes simple is best. What a great quick dessert– It is fun, easy, and delicious. It’s a giant cookie! 🙂 It would be excellent with a scoop of vanilla ice cream but we loved it plain, warm from the oven. This recipe is from Martha Stewart Living. I used semi-sweet chocolate chips. Preheat oven to 350 degrees. In a medium bowl, whisk together flour, baking soda, and salt; set aside. In the bowl of an electric mixer fitted with the paddle attachment, cream butter and sugars until mixture is light and fluffy, about 3 minutes. Add egg and vanilla; mix until they are fully incorporated. Add flour mixture, and beat until just combined. Stir in chocolate chips. Transfer dough to a 10-inch ovenproof skillet, and press to flatten, covering bottom of pan. Bake until edges are brown and top is golden, 30 to 35 minutes (in a convection oven). Don’t overbake; it will continue to cook a few minutes out of the oven. Transfer to a wire rack to cool, 15 to 20 minutes. Cut into 8 to 10 wedges. Serve warm, with vanilla ice cream, if desired. Thanks- It would be great to bring for a potluck too. That’s a COOKIE?!? Wow!!! The only trouble with making one huge one is I’m pretty sure all portion control flies out the window. I’d maybe eat the whole thing in one sitting. I hope you hve more willpower than I do! Too funny! I am pretty good at rationing around here…. 🙂 It is pretty rich- that’s why we skipped the ice cream! so happy you enjoyed it! Namaste! Thank you & Thanks for your follow! 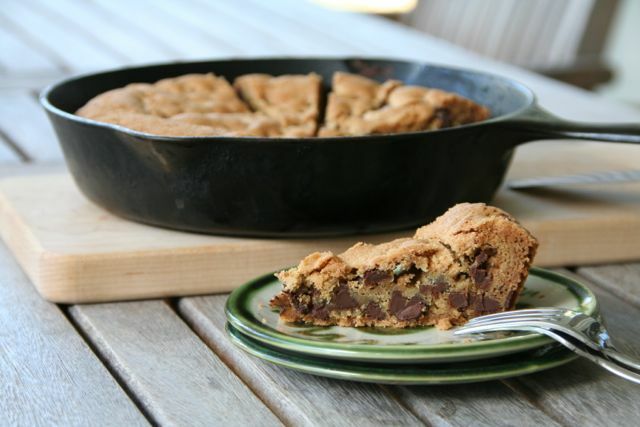 🙂 Skillet chocolate chip cookies would probably be a big hit in Hong Kong- yes? 🙂 Have a great weekend! Nice job on the photography, looks amazing!! Something new to try and it sounds easy. Thanks. Hi…so funny, my daughter and I were planning to bake chocolate chip cookies tomorrow and were debating recipes and I get this email with 10 different ones and my little girl thinks this looks the most fun, lol. They look great…question..do you need to grease the bottom of the skillet in any way? And I just have a regular electric oven…is the time and temp the same? Great! It is fun to make a giant cookie!! 🙂 You don’t need to grease the skillet because they are SO buttery. The oven temperature is the same- you will most likely just need to increase the baking time. Just check for the top to be a light golden brown. Enjoy!! It’s National Chocolate Chip Cookie day!!! I have this going in the oven right now. I can’t wait to cut into it.